How would your child complete this sentence: I love my teacher because ______________________. 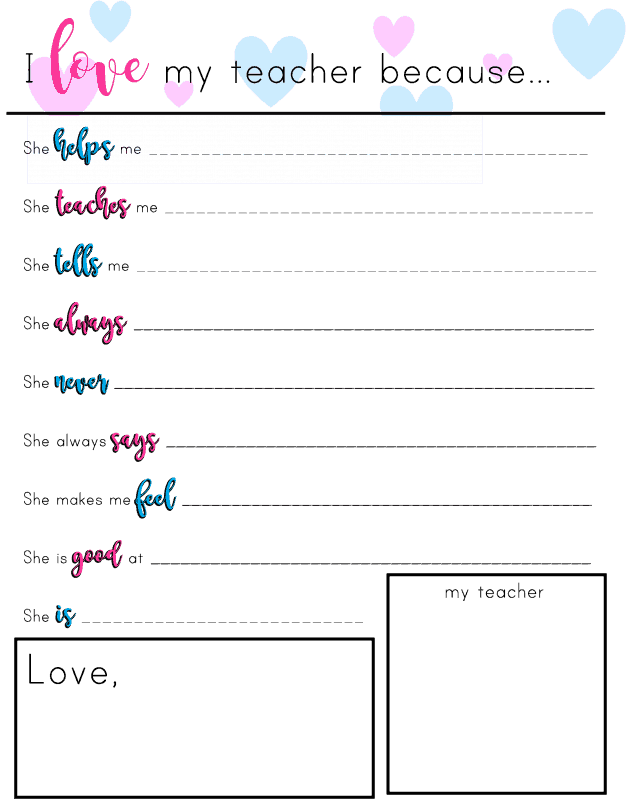 This I love my teacher because printable makes it super simple to help your child express their love for their teacher. As a teacher myself, I very much appreciate getting gifts, but the ones that I treasure the most aren’t the mugs, or the gift cards. The ones that I really love are the handwritten notes and cards. The ones that make me laugh, smile or make me feel like I’m making a difference in my student’s lives. This is the perfect teacher appreciation gift for Christmas, Valentine’s Day, the end of the year… You could really give this gift whenever. My daughter has an amazing kindergarten teacher. And I know (from experience!) that her teacher probably doesn’t hear that very much. Maybe she hears it more than me because I’m a middle school teacher, and we all know how middle schoolers are. But anyway. 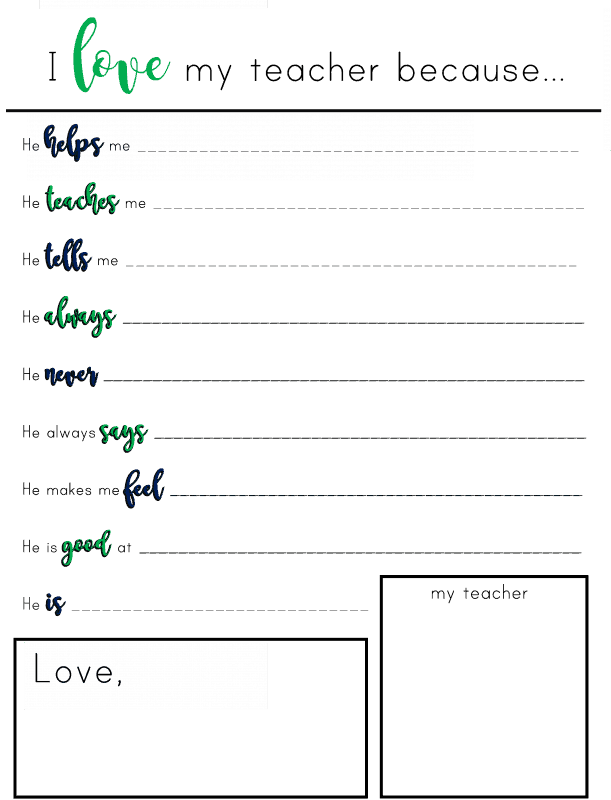 I created this all about my teacher free printable as a way to express our appreciation. But I also created it to help my child to show her appreciation for her teacher. Because my daughter is 5 and she doesn’t really know how to put her extreme LOVE for her teacher into words. She needs a little prompting to kind of get it out. I love my teacher because she helps me feel better. Kindergarten has been a rough adjustment, so this such a big part of why her teacher is amazing. She always talks to me. My teacher is great because she never gives me a card change. And for my rule-following child, never getting a card change is life. She always says Toots. She calls her Toots (like Tootsie). She makes me feel happy. I love my teacher because she is good at the calendar. Lol! Print the female or male version. 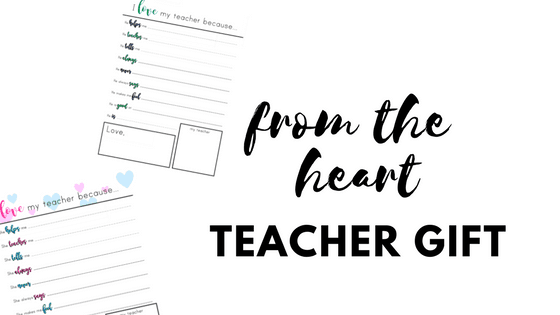 Use this thank you note to teacher printable for your child’s teacher today! And you can also get my bus driver appreciation printable. I would love to hear your child’s responses! My son is a very difficult child and his teacher this year is amazing and so patient with him. I was trying to think of something special to add to her gift that conveys how much we truly appreciate her. This is perfect. Thank you! I’m right with you! My daughter’s teacher has been absolutely amazing, and we’ve had some rough patches this year so I’m so very thankful for her. Glad you love it! As a former teacher, I can say that I would have LOVED to receive this. Such a sweet- and easy!- idea. Right? We just want a little appreciation! !